Recently we spent a weekend in the Sheboygan, Wisconsin area. 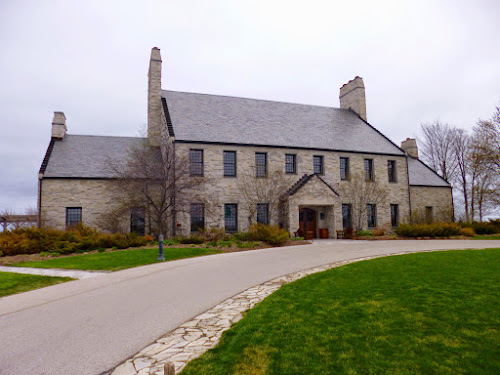 Our main reason for the trip was to visit the American Club Resort in nearby Kohler (the brewery tour mentioned in our last post was just icing on the cake). Kohler, Wisconsin is famous because it's where your bath tubs, sinks, toilets, and faucets come from. 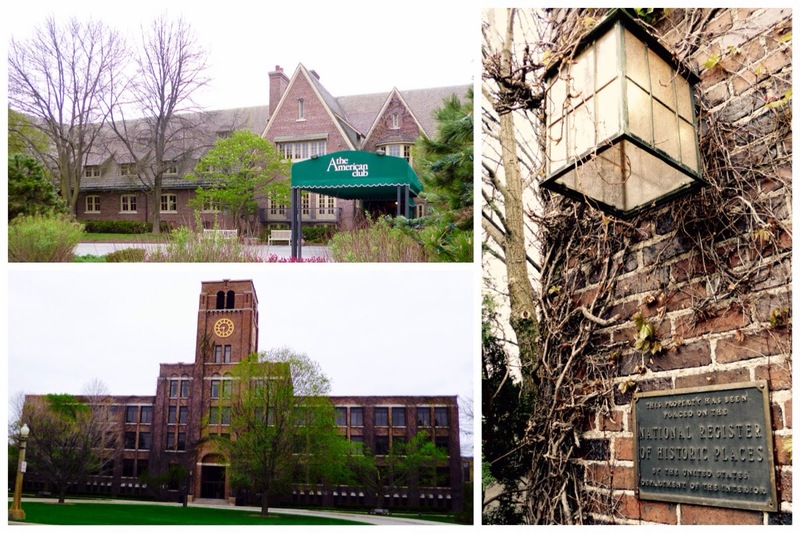 The town of Kohler was founded after the company of the same name planted its roots there. In 1918 the company built a dormitory for its immigrant workforce within easy walking distance to the factory. Tenants received full board and access to a pub, bowling alley, and on-site barber. The building was named The American Club in hopes to inspire the residents to consider U.S. citizenship. 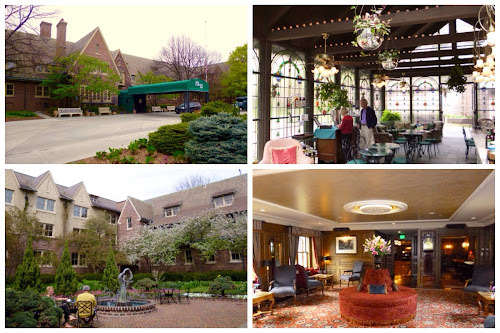 In the early 80's the property re-opened as a hotel and it is still owned by Kohler. We've known of the hotel's reputation for a long time but we finally put the wheels-in-motion to visit after seeing it featured on an episode of myhousewifelife. 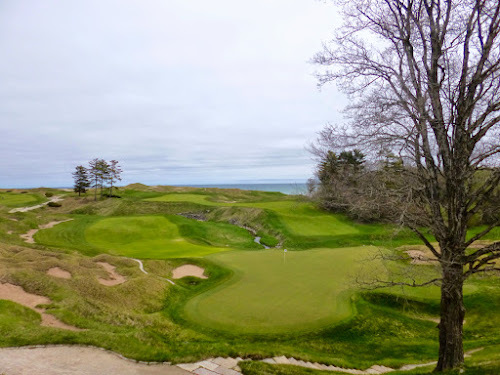 The American Club has two separate hotels within walking distance of each other (branded together as Destination Kohler). There's the Inn on Woodlake which is a modern building connected to a high-end strip mall, and there's the original American Club building with its Carriage House attached to the spa and Kohler Design Center. 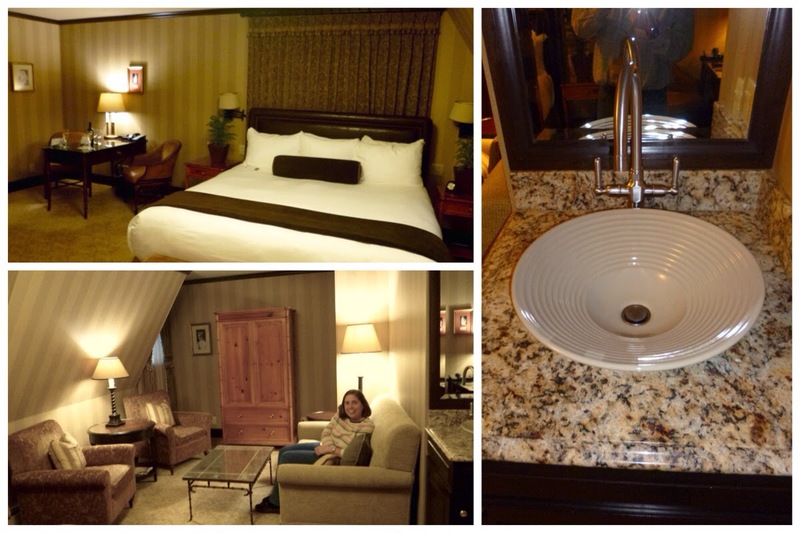 We chose to stay in the American Club main building and lucked into a room upgrade. We received a welcome champagne at check-in and found chocolates in our room with our welcome packet. The standard room has a king bed, wet bar/mini bar, and Kohler shower with multiple jets and features. Our upgraded room included a sitting area with couch and chairs plus a 2 person jet tub. All the rooms are named after famous people. We stayed in Maude Adams. Unfortunately our room was directly across the street from the Kohler Corporate HQ with its working clock tower. There are several pleasant public areas in the main building aside from the restaurants and bars. There's a good sized library with lots of seating, a smaller formal room with fireplace, a large courtyard and garden, and a stain glassed enclosed coffee house. There are dining options in the main building, the spa, the nearby shopping center, and the Kohler-owned golf courses. Shuttle services linked all the properties. 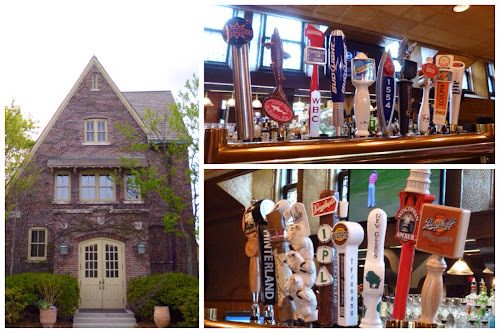 Friday and Saturday we experienced the Horse and Plow pub. Great beer menu here with a lot of options on tap and in bottles. Many of the items were local and quite a few were dark malty beers (hooray!). We had some snacks for lunch on Saturday including the Honey BBQ Bacon Bites. 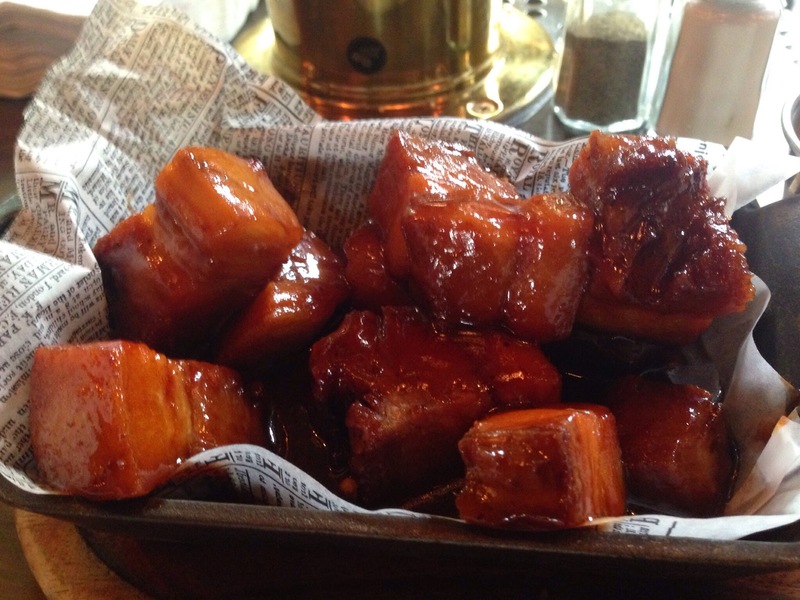 These were pieces of pork belly smothered in BBQ sauce. Friday night we took a short shuttle ride over to the Blackwolf Run Golf Course. This was the resort complex's steak house that resided in a log cabin overlooking the course and forest. The weather was pleasant enough to dine outside. We were treated to a great sunset while we had some wonderful specialty cocktails and appetizers of coconut/almond shrimp plus beef/asparagus rolls. For main courses Holly chose the beef filet and Dave the pork chop. Both were great choices. 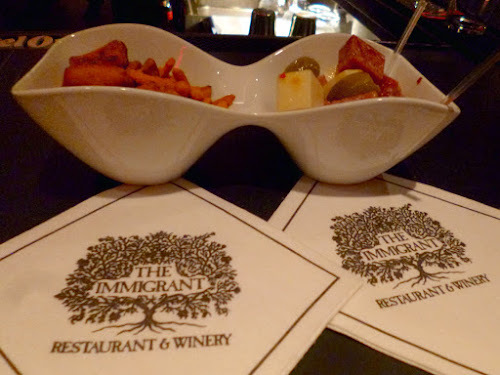 Saturday's dinner was in The Immigrant restaurant in the basement of the main building. We started off with cocktails in the wine bar before being escorted to our table in the English Room (rooms were named for countries). This was a "jacket required" place where all the servers attending to you addressed you by your last name. At one point a server realized they missed our bread course and bolted to rectify it. 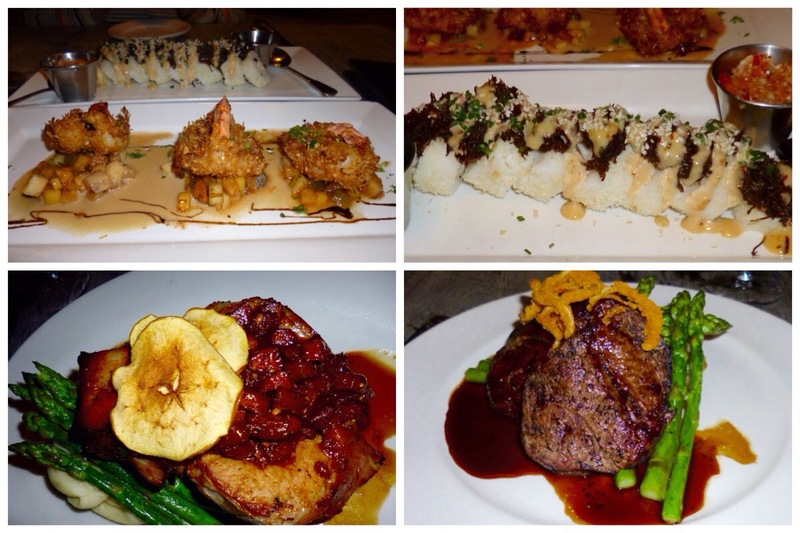 Since we did not want to be annoying with flash we did not take good pictures of the food. We had a cucumber gazpacho amuse bouche, shared appetizers of asparagus and barley risotto plus tiger prawns with ricotta cavatelli. For entrees Dave had the filet and Holly the sea bass. Dessert was a chocolate ganache peanut butter and jelly creation accompanied by the best ever pressed-pot Peruvian coffee. Everything was excellent. Sunday we had the brunch buffet in The Wisconsin Room, which was the Club's original dining hall. Brunch was especially busy that morning since it was Mother's Day. We could not secure a reservation earlier than 1:15, but we checked in early and sat down at our table at 12:45. One nice feature about this buffet was the unlimited mimosas. 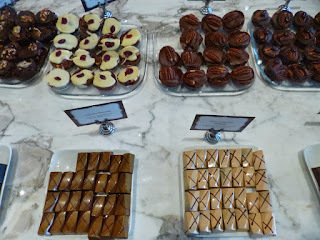 The variety wasn't as large as we've seen on other buffets but the quality and maintenance certainly was much better. 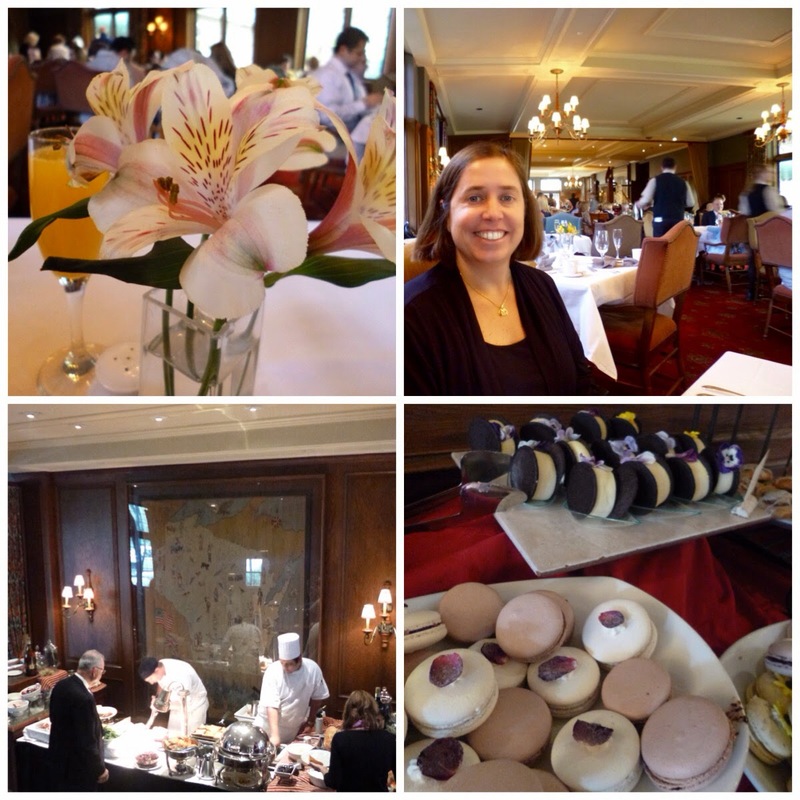 Selections we enjoyed included shrimp, rocky road bread pudding, creme brûlée french toast, bacon, eggs benedict, little pastries, etc. We ate way too much and we're excited to have the 2 hour drive home ahead of us. 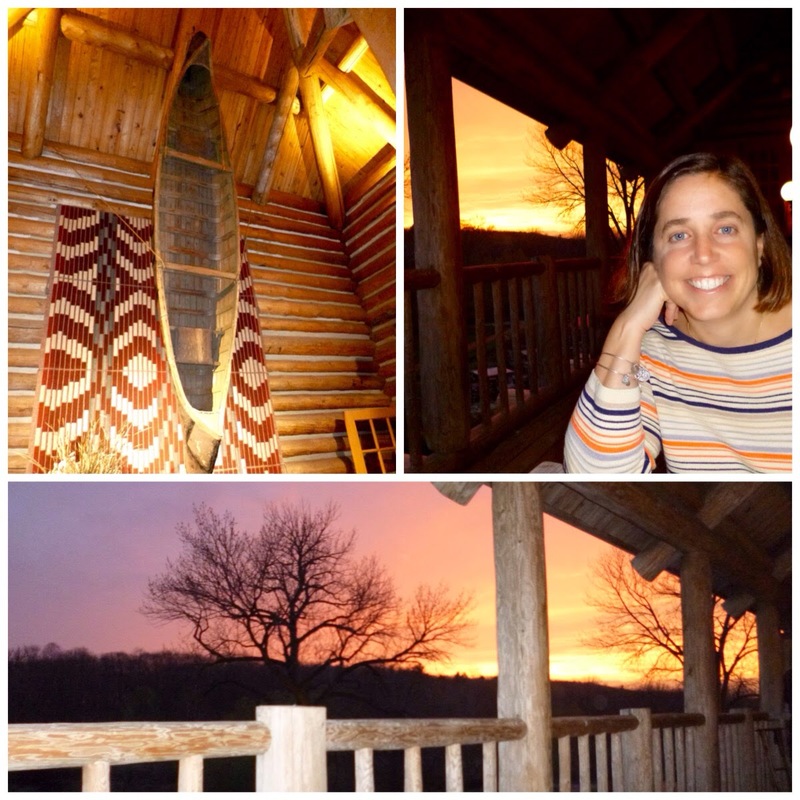 We'll start with a list of what we did not do: We did not take advantage of the resort's nature preserve - it was a drab weekend. We also did not golf on either of the two golf courses. We did take a drive to the resort's Whispering Straits golf course. It took us about twenty minutes to head to the club placed on the shores of Lake Michigan. The main building (do you call it a club house if it's not a club?) looked as if it belonged in Scotland. 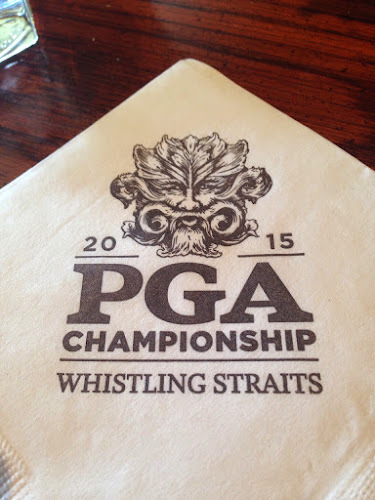 We enjoyed a beverage in the second floor lounge and learned that this will be the home of the 2015 PGA Championship. Dave's first thought: Where are all those people going to stay? Where do they park because the lot was pretty full this morning? We visited the Kohler Water Spa. We were excited about this experience because of the hype they placed on their website about all the amenities in the spa like the public area pools, sitting areas, and snacks. If you weren't receiving a treatment (2 treatments other times of the year) the public area use would cost you $40pp. We arrived early and were escorted to our locker rooms. 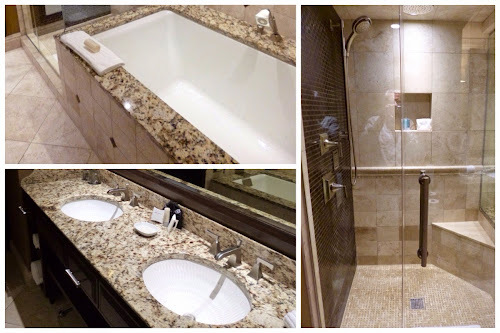 Each had an in-room hot tub, cold plunge, sauna, and steam room. The lockers are connected to a public pool area with a waterfall. There were 8 lounge seats around the pool and snacks of tea, water, apples, and almonds. We made our way to the 4th floor hot tub. No snacks up here.... This area included 6 loungers, some outdoor seating couches, and a bench by the fireplace. We were able to order some champagne while we relaxed before our treatment. 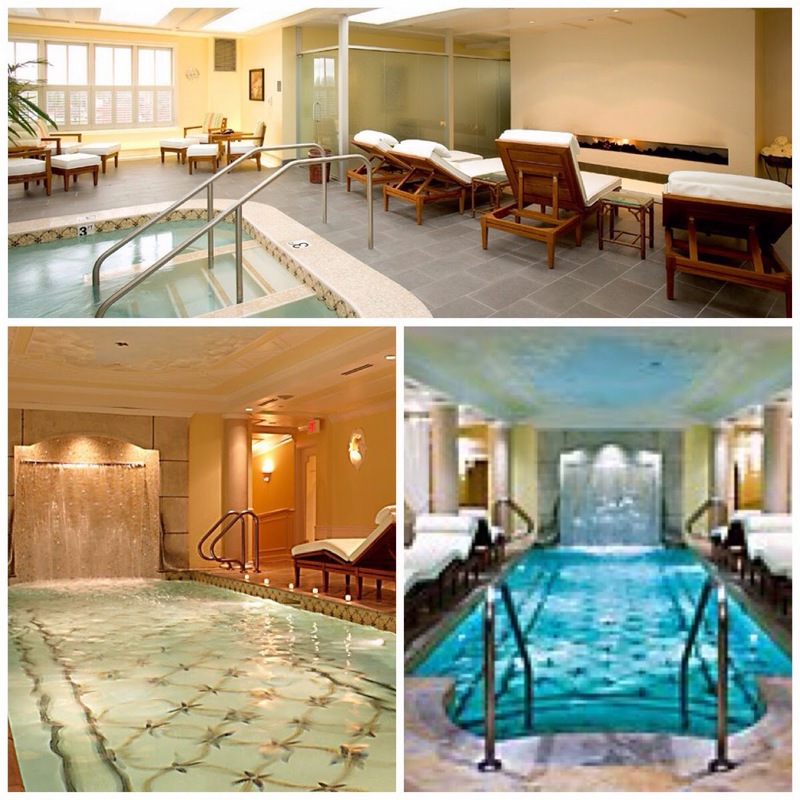 We chose a couple's treatment of combined river bath + massage. The treatment started with us getting a full body exfoliation. The massage technicians used loofah gloves to perform this task. 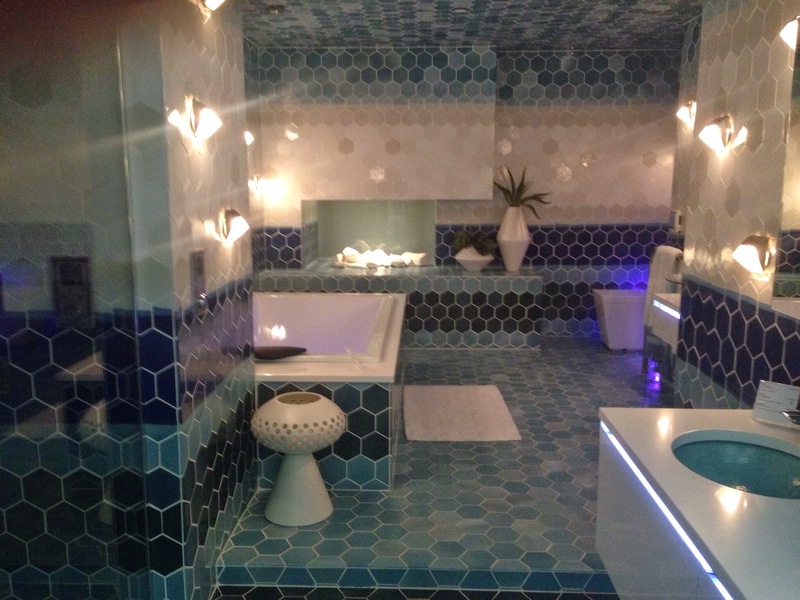 Next, we were led into a very large Kohler bath tub complete with multiple jet settings and lighting sequences. Following a twenty minute soak we were escorted back to our tables for the full body massage. The pressure applied was typical resort spa pressure (not so much). After the treatment we thought about hanging by the main pool, but the area was overflowing with people. They clearly did not have enough seating for all the treatments occurring during the day and people were lingering. We were a little underwhelmed by the spa. Our treatment was nice, but we expected a lot more spa amenities, especially for the price and service charge if you weren't getting a treatment. They definitely needed more snack offerings and seating in the common areas. The Hotel Hershey's spa was a nicer overall experience. We browsed the shops at the Inn on Woodlake. Many of the stores were of no interest to us: furniture, clothing, gardening, etc. We did enjoy browsing the chocolate shop, toy shop, Wisconsin shop, and the food market. Any grocery store that drops you into the wine section upon entry wins our vote. The final activity we took part in was touring the Kohler Design Center. 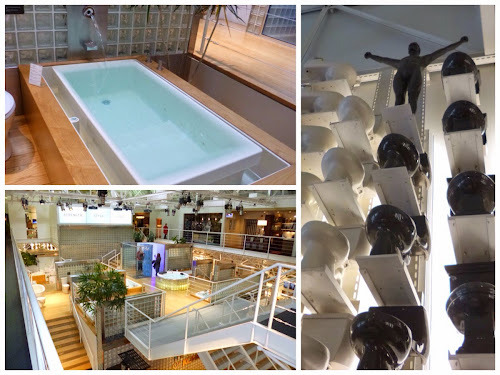 The basement holds the Kohler Museum and the top two floors showcase Kohler products. They had sample applications of their products in dream themed bathrooms. This was fun to walk through, but would have been more fun if we were in the mood to actually remodel a kitchen or bath. We really enjoyed our weekend at The American Club. We enjoyed the hotel, its amenities, and dining options. 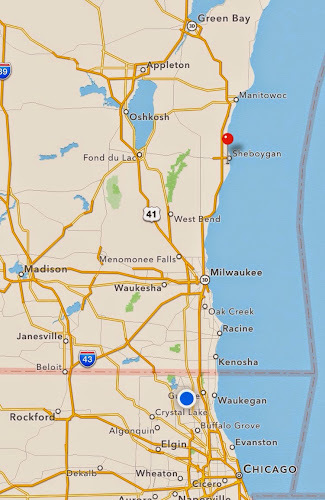 We would like to go back (maybe in early fall season) to experience the nature reserve and check out more of Sheboygan. We did not miss the hassle and high cost associated with parking at Chicago hotels. Everything was very relaxed and the staff did their best to take care of the guests. We had enough time over two nights to do everything we wanted to, including the brewery tour in town. 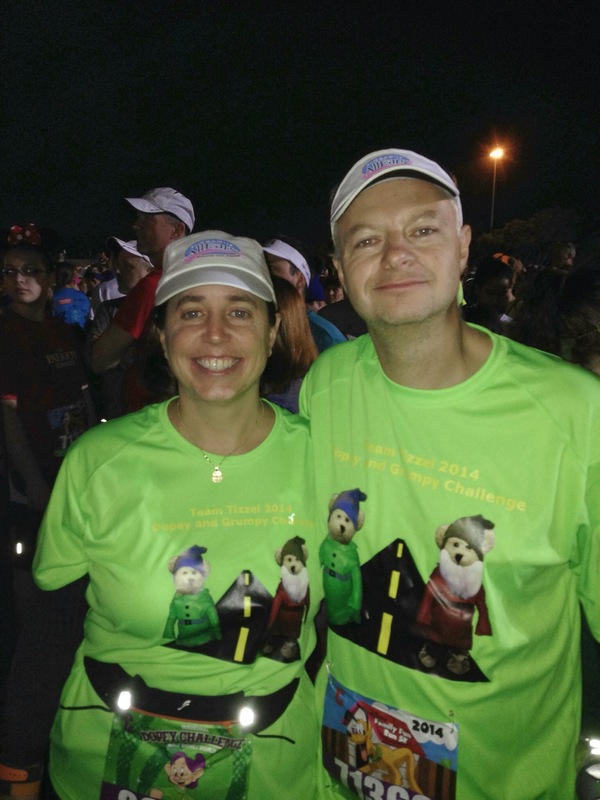 Holly and Dave formed Team Tizzel as a way to share race reports and other travel-related items while raising awareness for various charities. They live in Northern Illinois and spend their free time traveling, boating the Chain O' Lakes, and participating in races. Holly runs several marathons a year and is currently working on the goal of "50 Marathons in 50 States". Dave mainly follows the course and takes pictures and video. 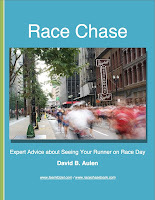 He authored a guide on spectating distance races which can be purchased at racechasebook.com. As part of Team AllEars they raised over $33,000 for Avon's Breast Cancer charities and now focus on raising awareness for different causes through "Team Tizzel's Charity of the Month"
Team Tizzel wrote an ebook on race spectating! Get it here! All images are owned by us or borrowed with love. Theme images by Raycat. Powered by Blogger.